vCard Wizard PRO PLUS allows you to manually map any CSV file with any other CSV file. Most popular CSV sources (Google, iCloud, Office365, Outlook) will have the mapping already suggested – you can use the default mapping or modify according to your own needs. 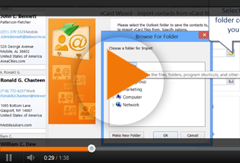 vCard Wizard PRO PLUS includes all features of vCard Wizard PRO. Advanced Mapping Wizard.Select source CSV file, destination CSV file and map files while being able to preview what every row of the CSV file contains. Use default profiles.Default mapping profiles allow you to easily change the mapping based on the source you are trying to remap. Create your own mapping profiles.If you are trying to remap a custom CSV file, you can save that profile for future use. Preview Contacts or any other data in CSV file before transfer.With vCard Wizard PRO PLUS edition, you will be able to preview the transferred CSV file data to make sure everything works as you expect.